Since the 1990s, two observation towers and an observation hut facilitate undisturbed observation of bird life in the Lower Oder Valley. As early as the 1990s, the Lower Oder Valley National Park began the development/building of the tourist infrastructure in the protected area. At that time, two observation towers and an observation hut were constructed in order to allow visitors of the northern national park undisturbed nature observations from an elevated location. A tower was built directly on the southern edge of the town of Gartz (Oder), at the Oder-Neisse Cycling Route. The main objective was to let the visitors experience the migration of the cranes from here, which use the National Park in autumn for several weeks as a resting place during their migration south. The cranes find undisturbed sleeping places on the areas of the Polish Inter-Oder land in between the western and eastern Oder that have been unused for 70 years. During the day, they look for food on the harvested fields around the town of Gartz (Oder). Visitors can watch them pass between their sleeping and feeding areas during the morning and evening hours. 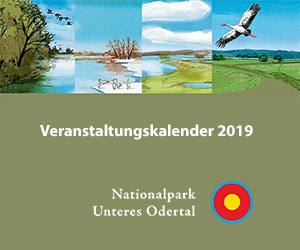 The Lower Oder Valley National Park organizes a crane week in September each year. From the Oder dike, hundreds of tourists then observe the natural spectacle of the crane migration with binoculars. Another tower was constructed at the Oder dike near the “Schwedter Querfahrt”, at Wrechsee Lake. From the tower and a nearby hill, tourists can observe a colony of black terns, which is regarded as the largest colony of this bird in Brandenburg. Black terns are extremely rare and are considered an endangered species in Western Europe. In the Lower Oder Valley National Park, the black tern still finds suitable breeding sites. Voluntary nature conservationists had already begun to install artificial nesting aids in the 1980s in order to preserve the population. In 2003, the Nature And Biodiversity Conservation Union in Germany (NABU), regional association of Schwedt, launched a second aid programme, during which the number of breeding pairs increased from 43 to 127. In 2013, ornithologists counted 195 breeding pairs here. Currently 900 breeding pairs exist throughout Germany. The “Tern” observation hut is located approx. 1.5 kilometres south of the Gatow Bridge on the winter dike at the Hohensaaten-Friedrichsthaler Waterway and allows for nature and bird observations in polder 10. When it was built in 2006, the polder was still dry in summer and was used for agriculture. Meanwhile the area north of Schwedt is a wilderness zone and the water of the Oder can freely flow in and out. During floods, visitors can enjoy a particularly beautiful view over the flooded polder landscape. Furthermore, this wilderness area is a regular breeding ground for rare and endangered bird species, such as white-winged, whiskered and black terns. Tourists can also observe different duck and reef species throughout the year. The observation hut is barrier-free and easily accessible for wheelchair users. One special attraction is a telescope for public use.